Home > News > Product Knowledge > How to Adjust the Discharge Granularity of the Roll Crusher? We all know that the roll crusher is mainly used for crushing high-hardness, medium-low hardness iron ore agglomerates and lead, agglomerate building materials, refractory materials and other industrial sectors to break medium and high hardness materials, which is one of the indispensable equipment in the sand production line. 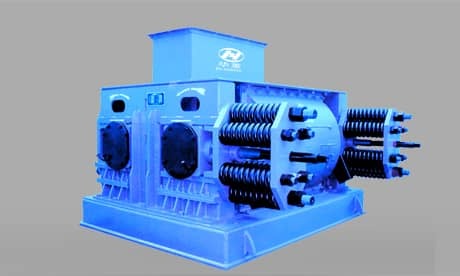 Its structure is simple, lightweight, reliable operation, low prices, product granularity and in iron ore crushing, mills and smelters, etc, is one of the indispensable equipment. So, how to adjust the discharge granularity of the roll crusher? The gasket device of roll crusher is used to adjust the size of discharge grain by increasing or decreasing the number of gaskets or thickness. When the gasket is added, the gap between the two rolls becomes larger, and when the gasket is reduced, the gap between the two rolls becomes smaller. The discharge size becomes smaller. Wedge or washer adjustment device is installed between the two rolls of the roll crusher. The top of the wedge device is equipped with adjusting bolts. When the adjusting bolt pulls up the wedge, the wedge will lift the movable roller off. The wheel, that is, the gap between the two rolls becomes larger, and the discharge granularity becomes larger. When the wedge is downward, the two rolls of the movable roll become smaller under the action of the pressing spring, and the discharge granularity becomes smaller.